Faces iMake examples. Image source: facesimake.com. This whimsical app has been a favorite of my three-year-old son and six-year-old daughter for several months (which is a long time for any app to hold a kid’s attention). 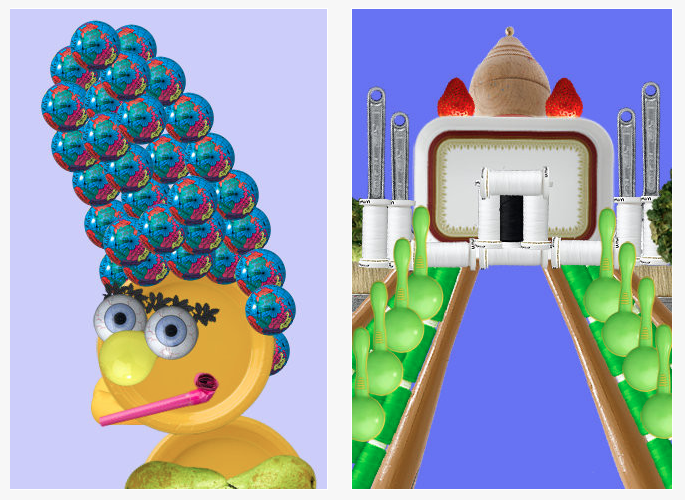 Gameplay is simple: you select from an assortment of household objects and foods to create funny faces. You can add your own photos to the pool as well. It’s engaging and amusing, and it’s a great introduction to collage art. (You don’t just have to make faces — lots of creative possibilities here.) Finished pictures can be converted to puzzles, emailed to admiring grandparents, or stored in a gallery. Does every character need to be pulsing so that the child feels the need to swipe and tap instead of following the story? They’re swiping and tapping because they might miss out on something (not too different from older kids worried about missing a tweet or instant message). Instead of following the storyline they are jumping around distracted instead of enjoying a great story. At iMagine Machine when we think about new apps we try to create ‘slow apps’. We want them to be fun and exciting and entertaining but at the same time we feel the excitement needs to come from the child. When the child has followed through on a series of problems, worked through a puzzle or created an amazing piece of art on the app – that’s where the reward comes. For another example of the Slow App Movement, check out iMagine Machine’s Monsters Family. What do you think? Are the majority of kids’ apps too frenetic? Do your preschoolers jump from app to app, or do they focus intensely on one special favorite at a time?